The following offers not only Bluebird history, but how you can offer winter protection for these birds by providing a roosting box. With complete dimensions. This brightly colored bird has always been a romantic symbol for their unusual coloring as well as their gentle loving nature. In Victorian times, they were a common artful addition to romantic floral artwork on greeting cards and calling cards. Today, it is a rare thing to see a Bluebird flitting about. The Bluebird is a native American. When European colonists originally settled this land, they had been here for thousands of years. It is believed that when the virgin forest on the east coast was in the first stages of being cleared, the Bluebird flourished and became more abundant. Its original adversary the Wren also became more plentiful right along with them though. The Wren is far more aggressive then the Bluebird and searches for a very similar type of abode. So as both species multiplied, the wrens made it hard for the Bluebird to make a home. Two events in bluebird history caused the dwindling of our brilliant blue native's numbers. The ships that carried the influx of human immigrants to our shores in 1851 and 1890 also gave passage to two feathered immigrants from Europe; the House Sparrow and the Starling. Both of these newcomers were adapted to the crowded industrial environments of urban and suburban Germany and England. 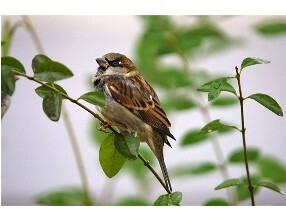 The Sparrow already was known to have spread on that continent. Being resourceful, they quickly adapted to living in rural farmland. 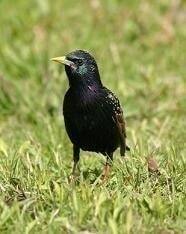 Both Sparrows and Starlings like a roof over their head. The new squatters aggressively put pressure on the gentle Bluebirds and took over their nests. With so many people inhabiting the United States today, it is little wonder we see very little of the country loving Bluebird. There is a growing interest in the creation of housing for this beloved species beyond the bird-watching enthusiasts. 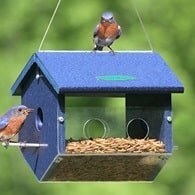 The Bluebird house is becoming a popular addition to backyards, school property lines and farms again. Bluebird houses were first put up in the late 1800's by bird lovers trying to accommodate their need for housing after the Sparrows and Starlings took over the easily accessible barn rafters, nooks in houses, hollow trees and fence posts across America. Natural nesting sites have also grown more scarce as farmers now manicure their orchards, and wooden fence posts have fallen out of use in exchange for metal ones. By the 1930's bird watchers were already wondering what happened to all those sweet singing beauties of days not so long gone by. 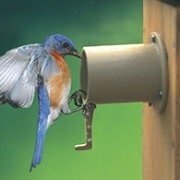 The first studies of Bluebird nesting habits were conducted in 1919 in Minnesota. Successful nest sites were measured for the size of the holes, as well as for the exact location and the role of predators and competitors. The tests were done in open pastures, orchards and suburban back yards. Concluding that only with massive saturations of scientifically designed predator-competitor proof nesting boxes could the decline of the Bluebird be stopped. So they established and monitored Bluebird trails with tens to hundreds of nesting boxes strung out across the land. The monitors set up communication networks in newspapers, magazines and the mail. Wherever there were Bluebird trail sponsors, Bluebirds began to reappear for people to enjoy. It is quite a thrill to see one, especially when one understands the odds against their gentle souls. It needn't be inevitable that Bluebirds, once the most common thing in a yard, continue to loose ground against these alien intruders. Their population has dwindled and become so low, they are almost like a myth. Our Eastern Bluebird has suffered the most serious in loss. Amateurs and bird lovers alike can accomplish the job in restoring the numbers of our native azure friends. The trails already in existence across the USA and Canada form a network of hope across the continent. Armies of trail tenders and box erectors will bring more and more of them back to your yards as the number of boxes grows greater. Found only in North America, these sweet noted dwellers of fence posts have a tender voice to go along with their gentle nature. No other species of bird has been used as much as the Bluebird in poetry and songs as a symbol of love, hope and happiness. The early settlers looked upon this bird as the sign that spring had arrived, and in bluebird history fondly called it the Blue Robin. In Michigan, as all the other states east of the Rocky Mountains, we have the Eastern Bluebird. There are only two others, Western and Mountain. Their diet is mainly insects, most of which are yard and garden pests. In the spring they love the cutworms that ruin crops and garden plants. Later in the summer through fall they dine on huge quantities of grasshoppers and wild berries. It is said that their courtship is beautiful and amazing, but it is a rare sight to behold. The Bluebird is very territorial, the male protecting his food supplies from other male Bluebirds trespassing. The nesting site must have sufficient food for them to raise their young and exist themselves for them to be tempted to set up housekeeping. Only the female builds the nest in the chosen shelter, while the male accompanies her solely by singing his encouragement while she works. Nest building starts in mid-May in Michigan and 3 to 5 clear blue eggs are laid in the clutch. The baby birds grow alarmingly fast, ready to leave the next in 15 to 20 days after hatching. By that time they are strong enough to fly fifty to one hundred feet their first attempt at flight to the nearest perch. By early September most Bluebirds have finished up their family responsibilities for the season. A fortunate pair will have raised two or even three broods by that time. During the fall, families of Bluebirds roam leisurely through the countryside on a quest for insects and berries in great abundance. Over these travels, different families join together in a loose flock, as they get ready for migrating. The date of their heading south is timed more by the weather and food supply than by the calendar. They migrate in search for food and congregate in more southern parts of their regions. It is not that the Bluebird cannot spend winter in the northern areas like Michigan, bluebird history shows us they will stay as long as the food supply lasts. Planting trees, shrubs and vines with berries that last through the winter will provide much needed foor for wintering birds. Throughout Bluebird history its been shown they prefer a natural habitat of any of these, Bittersweet, flowering Dogwood, Cotoneasters, Washington Hawthorns, Privet, Sumac, Pyracantha, flowering Crabapples, Virginia Creeper, multiflora Roses (rose hips), and Mountain Ash are all favorite food sources in the cold season for birds that thrive in the northern climates. They can sometimes be tempted to feeding stations with raisins, other fruits and berries and chopped unsalted peanuts, but they are not seed eaters so you will never find them eating from normal bird feeders. Should the small fruits and berries they depend on become crusted with ice and snow, the effort of providing food will keep them from starving to death. If they are forced to go to roost hungry, bitter cold will cause many of them to die. Properly built houses are enough protection from severe weather for them to live year around. If modified, several can spend the night together sharing heat. 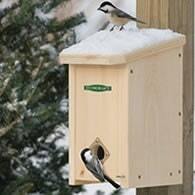 To accommodate them for winter roosting, the box should be large enough to shelter a number of birds. Floor dimensions should be 10" x 10", with a depth of 18" and a width of 24". The hole must be 1 1/2" or Starlings will move in on them, and needs to be at the bottom of the box with a perch placed beneath it. Several horizontal perches should be positioned inside at various levels at staggered intervals up one sidewall using 1/2" doweling. The side of the box should be hinged to allow cleaning in the spring. The box must be at least 6 feet of the ground to protect them from predators while they sleep, using a smooth metal pole that is greased so that nothing can climb it to reach the box. Place the winter roosts facing south for the most warmth from the sun. For nesting boxes, again the hole should measure only 1 1/2" and be situated about 5 foot off the ground for observance of the young in the nest. 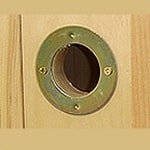 But for the nesting the hole should be toward the top of the box to protect the young from cold drafts. The nesting box must face due east. Nesting boxes cannot be any closer than 100 foot apart. Too many boxes will result in no Bluebirds, remember, they're territorial and will only reside where they know there is enough food for themselves and their young. Small air holes should be put next to the roof board, and drainage should be provided in the floor so it will not fill up with water. The roof should be slanted downward in the front to stop rain from blowing into the nest. 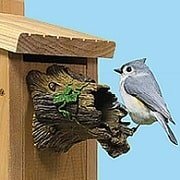 What a delightful preserve to add to your yard, create your own Bluebird Reserve. Stop spraying the cutworms and grasshoppers, plant oodles of berry-bearing plants, and erect proper housing for both seasons in a suburban to rural setting and trust me, they will inspect the site and set to building a nest. By providing a winter roosting box, you have a chance to provide for wintering birds and make the future of the Bluebird History one for the generations.